The gilder's source for leaf, supplies, tools and materials. Below you'll find access to our Genuine Silver Leaf products. Complete product descriptions are included as well as handy conversion tables, helpful hints, and new product announcements. Pricing for all leaf can be obtained by adding the item to the Quote Basket, calling or emailing SeppLeaf Products for a quotation. 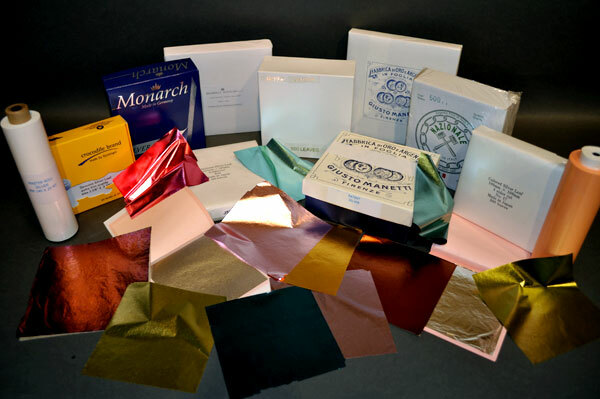 SeppLeaf Products offers high quality silver leaf in different thickness, colors, and sizes to cover each necessity of silvering. Silver leaf is available in loose (surface) leaf, patent (transfer) leaf, in an oxidized form, colored form, and in roll form. Genuine Silver Leaf is made from genuine silver containing no gold or other alloys. Silver leaf will tarnish like all objects made from pure silver. If the silver leaf you are looking for is not available on our website, please call SeppLeaf Products at 212-683-2840 to special order. Manetti - Italian Gold Roll 4-1/8 inch x 67 ft.
Manetti - Italian Palladium Roll 3 inch x 67 ft.
Crocodile - German Gold Roll 4-1/8 inch x 69 ft.
Italian Silver Master Roll 5-1/2 inch x 82 ft.
Metal Leaf Roll - 50 meter 6-1/4 inch x 164 ft.
Metal Leaf Roll - 75 meter 6-1/4 inch x 246 ft.
Schlagmetal Leaf - Box 6-1/4 inch x 6-1/4 inch.